Kathy Kallick is at it again, writing new songs, releasing new albums, and cooking up a bluegrass storm on stage. Singout! Magazine calls her “one of the best songwriters in bluegrass and acoustic music, always coming up with interesting, sometimes playful, always sure-handed songs” and praises her band as “a wonderful combination of youth and experience.” Annie Staninec sings and plays fiddle and clawhammer banjo, Tom Bekeny sings and plays mandolin and fiddle, Greg Booth sings and plays dobro and banjo, Cary Black sings and plays bass, and together with Kathy on guitar and vocals, the band sizzles and swings on compelling originals and bluegrass classics based in the Bill Monroe tradition. Kathy has been leading bands ever since she co-founded the groundbreaking bluegrass quintet the Good Ol’ Persons in 1975. She’s won a Grammy and two awards from the International Bluegrass Music Association, and recorded 17 albums, including a new bluegrass gospel collection, Count Your Blessings, and Time, which features four originals, plus fresh interpretations of songs learned from Bill Monroe, Vern & Ray, the Delmore Brothers, Rose Maddox & Mike Seeger, Fiddlin’ Arthur Smith, and Kathy’s mother. 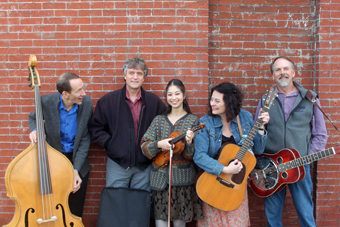 Bluegrass Now Magazine calls Kathy “a profound songwriter…expressive singer…and exquisite storyteller.” For an evening of hot bluegrass and cool originals, catch the Kathy Kallick Band at the Freight.